BOMK! POOL REMOVED AND REPLACED WITH HUGE LAWN AREA! ONE OF THE LARGEST LOTS IN COLONY PARK! 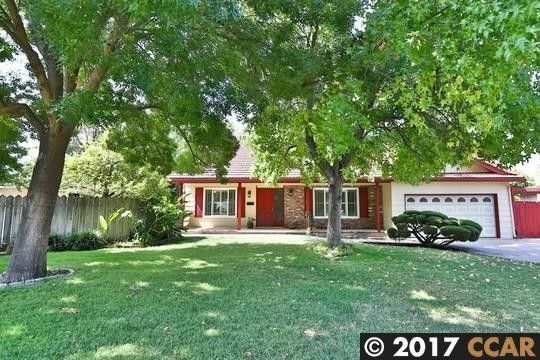 Beautiful 4 bedroom, 2 full bath 2-story home with lovely curb appeal. Bonus room off of master bedroom can be an office, huge walk-in closet, or potential 5th bedroom! Elegantly refinished hardwood floors. Freshly painted interior. Step-down family room with tile floor and cozy fireplace. Mirrored closet doors. Plantation shutters. Lots of additional storage areas plus practical pantry. BEST LOCATION: on the borders of Walnut Creek and Pleasant Hill. Walk and bike for miles on the Iron Horse trail; close to park, freeway, BART, shopping and restaurants. With over 1/4 acre, this huge 12,000 foot lot allows for privacy and seclusion. PERFECT FOR BBQ AND ENTERTAINING! Lots of fruit trees: pear, orange, plum, lemon and fig. Wide driveway can accommodate many cars. Potential RV/Boat Parking. Refrigerator, washer and dryer included. CLEAR TERMITE. New insulation in attic!